🎙️ Axios’ Pro Rata podcast with Dan Primack launches Monday. Subscribe here to get smarter, faster in just 10 minutes on the collision of tech, business and politics. We told you yesterday why elected Republicans go so silent so quickly when they disagree so strongly with President Trump: They fear it's political suicide to speak up. A whopping 79% of Republicans approved of Trump’s handling of Vladimir Putin at the post-summit press conference. And 85% think the probe into Russia’s war on our elections is a distraction. Why it matters: Trump’s superpower-like hold over the minds of Republican voters seems invincible. Be smart: This poll foreshadows the coming national drama. Every piece of data, and virtually every public action of elected Republican officials, shows Trump will have overwhelming and probably unbreakable party support, regardless of what Robert Mueller finds with his Russia probe. "But officials at the most senior levels across the U.S. military, scrambling ... to determine what Trump may have agreed to on national security issues in Helsinki, had little to no information." Mark Zuckerberg's willingness to allow Holocaust deniers to post on Facebook has reignited a consequential debate over where tech companies should draw the line on free speech, Axios media trends reporter Sara Fischer writes. What happened: Zuckerberg faced instant backlash yesterday after saying in a podcast interview with Recode's Kara Swisher that the company would not take down a post denying the Holocaust because of the possibility that the user did not intentionally get the facts about the event wrong. What he said: "I'm Jewish, and there’s a set of people who deny that the Holocaust happened. I find that deeply offensive. But at the end of the day, I don’t believe that our platform should take that down because I think there are things that different people get wrong." Facebook's approach to free speech, and most areas of regulation on its platform, is to consider the greatest possibility of good intent by all users. Zuckerberg later sent a clarification email to Swisher: "I enjoyed our conversation yesterday, but there’s one thing I want to clear up. I personally find Holocaust denial deeply offensive, and I absolutely didn’t intend to defend the intent of people who deny that." Key quote: "These issues are very challenging but I believe that often the best way to fight offensive bad speech is with good speech." The company also clarified to reporters last evening that it does not tolerate misinformation that incites violence. Why it matters: Facebook's policy puts itself in the untenable position of constantly defending some of the most offensive content imaginable, including some that is widely and unequivocally accepted as false by most cultures. That means most policies are designed to address an incredibly wide range of user intentions, including ones that may seem outrageous to the majority of people that use the product. Facebook tries to curb the spread of misinformation by down-ranking the pages and posts of users that post misinformation — or if they do it often enough, removing their ability to advertise, or removing the page altogether. The company won’t disclose how much misinformation one would need to post to be removed or punished, in fear that bad actors would game the system if that information was publicly available. Critics argue that this policy doesn't go far enough, and that Facebook should instead more closely adhere to the editorial scrutiny used by most media companies, since more than half of U.S. adults use Facebook to get news. Be smart: The policy makes Facebook a target for bad actors who know they can post false and often offensive information on the platform without necessarily being removed — or in some cases, punished at all. While Facebook uses artificial intelligence and human review of flagged posts to weed out bad content, as we have seen time and time again, those systems are nowhere near perfect, given the scale of content that is uploaded to the platform every minute. Unveiling a "Pledge to America's Workers," President Trump today will launch a White House effort to promote high-tech retraining for workers — preparation for a workplace that'll increasingly be dominated by data and automation. Why it matters: Workers, particularly in parts of the industrial Midwest where Trump is strong, are rightly worried about the threat to jobs from robots and automation. This is an effort by the White House to use Trump's bully pulpit to push companies to help their employees deal with job insecurity. Governors, mayors and business groups will also be enlisted. A key goal is retraining workers so they can fill data-economy jobs that are created in their current workplaces, rather than being laid off. 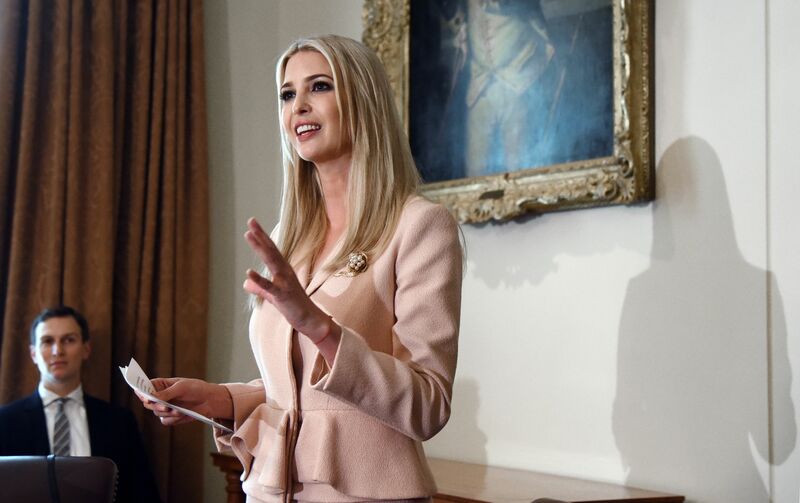 Ivanka Trump, who led Trump's Domestic Policy Council in developing the plan, told reporters: "We will be taking this effort outside of D.C. and into classrooms, communities, and businesses in the coming weeks, months, and years." The White House said Trump will sign an executive order in the East Room, joined by executives from IBM, FedEx and Lockheed Martin and other corporations. The pledge will commit employers to expanding apprenticeships and increasing on-the-job training to help Americans, from high schoolers to retirees, secure stable jobs and careers in the modern economy. Ivanka Trump said the corporate pledges announced today "will represent new commitments to students and to their existing workers," expanding current programs and creating new ones. The idea was inspired partly by the Giving Pledge, created by Bill and Melinda Gates and Warren Buffett, to encourage billionaires to give more than half of their wealth away. P.S. Wilbur Ross and Ivanka Trump co-hosted a dinner last night to highlight the White House's new workforce endeavor, at Ross’ house in D.C. Guests included Jared Kushner; Ross’ chief of staff, Wendy Teramoto; OMB Director Mick Mulvaney; and top executives of Lockheed Martin, UPS and FedEx. 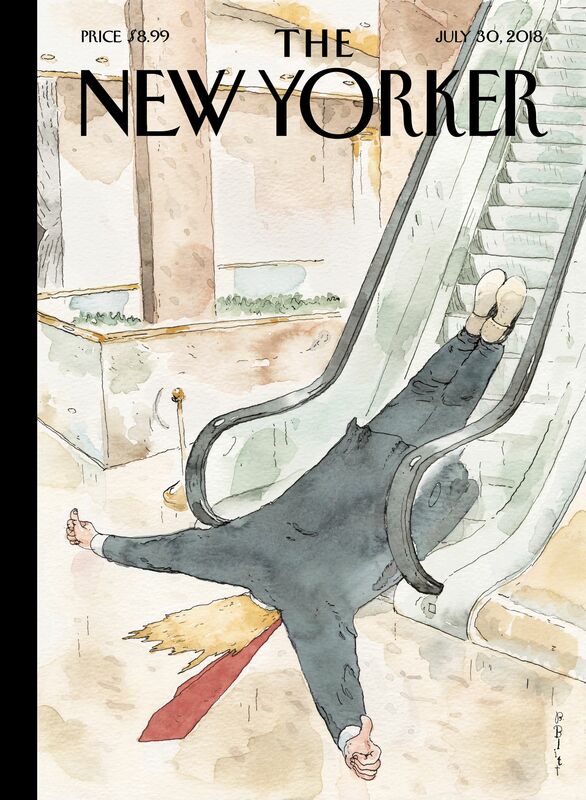 "That image makes a return in Barry Blitt’s latest cover, which remarks on Trump’s performance during and after his summit with Vladimir Putin." "I figure I’ve painted him eighty or so times in the past few years, which sounds like a lot, but somehow it’s actually left me with many blissfully Trump-free days." "Half of this gig — drawing topical cartoons — is about saving some absurd or iconic moment and then bringing it up at an unexpected or odd time. 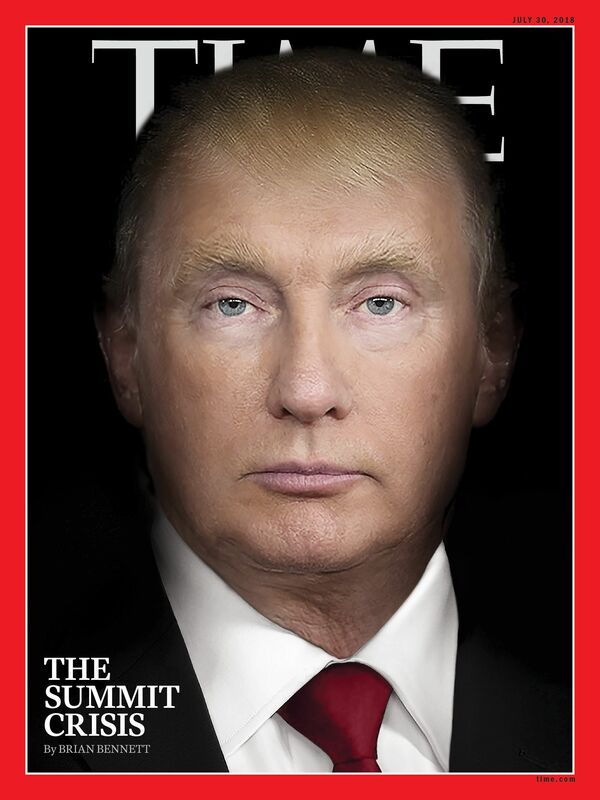 You can expect that soccer ball that Putin gave Trump to appear in an image in a year or two, probably." See more of Blitt’s Trump covers. First look: A series of measures of the national mood, especially presidential and congressional approval, are similar to past wave elections, pointing to a potential bonanza for Dems, lobbyist Bruce Mehlman points out in a new presentation. Go deeper: Mehlman's midterm deck. 5. Top Dems shy away from using "treason"
"A debate has raged in Democratic circles this week over how strongly to condemn Trump's comments." "The legal definition of treason is providing 'aid and comfort' to enemies of the U.S., a high crime." Why it matters: "If Democrats align behind the term, it raises the question of what they plan to do about it. The party ... doesn't have an answer." "The language also risks alienating swing voters who don't appreciate over-the-top rhetoric. After all, treason is a crime so serious that the convicted can be executed." "The result is that the country is increasingly returning to a pre-ACA landscape, where the coverage you get, especially for people without employer-provided insurance, is largely determined by where you live." Why it matters: "This is likely to be the driving dynamic of U.S. health care for years to come, as Republicans chip away at the ACA in the aftermath of a failed attempt to repeal it outright, spurring GOP-led states to do the same, while Democrats battle to preserve it in places where they can." Be smart: "The outcome is consistent with President Donald Trump’s goal to dismantle a one-size-fits-all approach of the ACA and leave decisions about many health-policy issues to the states." See the full #Global500 list. 8. Fortune's "40 Under 40"
See the full #Fortune40 list. "Soros was an early backer of Barack Obama’s 2008 presidential campaign. ... Soros told me that Obama was 'actually my greatest disappointment.' Prompted by an aide, he immediately qualified himself, saying that he hadn’t been disappointed by Obama’s presidency but felt let down on a professional level. While he had no desire for a formal role in the administration, he had hoped that Obama would seek his counsel, especially on financial and economic matters. Instead, he was frozen out." 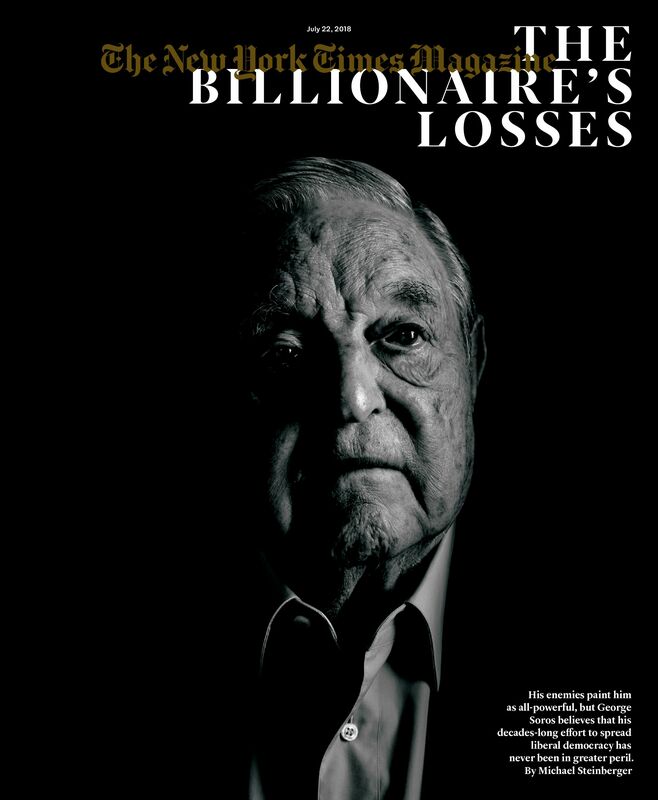 "After Obama was elected, 'he closed the door on me,' Soros said. 'He made one phone call thanking me for my support, which was meant to last for five minutes, and I engaged him, and he had to spend another three minutes with me, so I dragged it out to eight minutes.' He suggested that he had fallen victim to an Obama personality trait. 'He was someone who was known from the time when he was competing for the editorship of The Harvard Law Review to take his supporters for granted and to woo his opponents.'" 10. 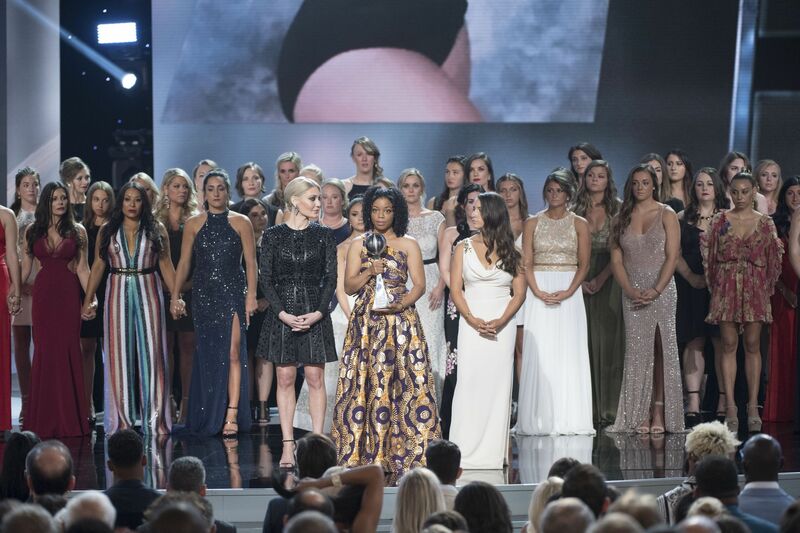 1 powerful moment of solidarity: "Sister survivors"
"The women who spoke out against the abuse by Larry Nassar stood together Wednesday night in a powerful and solemn closing to the show highlighting the past year’s top athletes and moments in sports." "Gymnast Aly Raisman, softball player Tiffany Thomas Lopez and gymnast Sarah Klein, who said she was Nassar’s first victim 30 years ago, took turns speaking. Klein chided the U.S. Olympic Committee, USA Gymnastics and Michigan State for placing 'money and medals above the safety of child athletes.'" Thanks for reading. Updates all day on Axios.com.